An ASIO (Australian Security and Intelligence Organisation - Australia’s domestic spy service) file exists on its monitoring of early UFO research groups. The ASIO file has been known about for quite some time and it has been up on the National Archives of Australia web site as a viewable file since at least early 2006. What it shows is that the UFO community was targeted like a whole lot of other diverse communities, all because of largely innocent flirtations with matters that fell within the paranoia of intelligence organisations. It didn’t take much to fall within this net, and very rarely did it have anything to do with the UFO phenomenon itself. 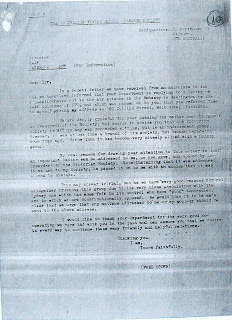 Most prominently in the ASIO file the Queensland Flying Saucer Research Bureau was the subject of monitoring and intrusion, seemingly because some members of the group took an interest in Russian investigations of the 1908 Tunguska event that suggested it may have been caused by a spacecraft. The group’s president Stan Seers described the bizarre situation that evolved from ASIO’s attention in his memoir “UFOs - the case for scientific myopia” (1983). 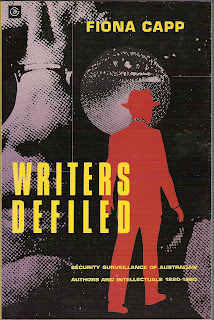 See also my document “UFOs Sub Rosa Down Under” (1996) at: http://www.theozfiles.com/ufos_subrosa.html and Timothy Good’s books “Above Top Secret” (1987) and “Beyond Top Secret” (1996). The rest of the file is more fragmentary. One letter in the file was of particular interest for me because it raised a dubious “rumour” about the Sydney based group the UFO Investigation Centre (UFOIC). The letter was written by Fred Stone, president of the South Australian civilian group Australian Flying Saucer Research Society (AFSRS), around 1960 to the RAAF, and passed onto ASIO by them. Therein Stone writes, "This may appear trivial, but (…) we have very good reasons for not altogether trusting this group (he was referring to the Victorian Flying Saucer Research Society - VFSRS) due to its very close association with the Sydney one (Stone was referring to UFOIC) which has some folk in its control who have "pink" tendencies ..."
By "pink tendencies" Stone was suggesting communist tendencies. I suspect that Stone was still harboring some ill will with the late 1956 UFOIC break away from AFSRS and VFSRS 1957 departure from the AFSRS national vision agenda. Stone may have thought he was being patriotic in passing on his "innuendo" to the RAAF, or it was inspired by negativity that flowed when the NSW branch of his group decided to separate from the SA group and operate as an independent group namely the Sydney based UFOIC. The difficulty with such slight "rumours" and "innuendos" is that they had the potential to feed the paranoia of the era. The ASIO file with exceptions can be accessed via the Australia National Archives on line. Ironically Stone even asked the RAAF to do security checks on some of his own SA AFSRS members. The RAAF declined to assist him. What RAAF/ASIO did "sub rosa" is not clear, if anything. In the case of UFOIC I have no direct evidence of infilitration. Indeed Stone's circa 1960 missive came at the end of the intense period of "red" inspired surveillance. Certainly a few years earlier it didn't take much to come under ASIO's "red" or "pink" watch, and in that context Stone's letter was very unsound and extremely unhelpful to the cause of open ufology. Fortunately it seems it had little impact, although full access to the ASIO file in question is still denied. In those days it didn't take much to be tarnished with this label, or worse still the "red" connection. Anyone with pacifist, intellectual or radical thoughts seemed to come under suspicion. Andrew Tomas worked closely with Fred Stone in organizing the remanents of the Sydney based Australian Flying Saucer Bureau into a NSW branch of the AFSRS during late 1955. Tomas, a "white Russian" may have been the focus of the Stone "rumour." It did not seem to reflect any substantial realities. “Concerning Fred Stone's comment in his letter to the RAAF - I am shocked! …that was the first time I had ever heard of such a suggestion (about "pink tendencies"). I suggest also that Mr. Stone's remarks were made in consideration of the rift which had occurred with the Sydney group, and they were uncalled for and completely out of place. I agree with this assessment. The "pink" labeling was inappropriate. Here were some basically good people from a broad range of backgrounds, united in a fascination for the UFO/flying saucer mystery. The paranoia of the times was often misplaced or just rooted in uninformed politicking. Ufologists Defiled? The 1950s was the high point of McCarthyism in the Australia particularly with the Petrov affair. Unfortunately, even if you were a "white Russian" (such as Andrew Tomas), and clearly not sympathetic to communism, the mentality of the era meant one was probably watched. Andrew Tomas was passionate about Shambhala inspired "peace doctrine", most evident in his "Planetary Doctrine" (1935) He was still circulating similar things in the 1950s. Pacifists of any persuasion would have got attention. It seemed that logic sometimes was not high on the agenda with our intelligence groups then, paranoia certainly was. Things have changed but sometimes, even now, you have to wonder. The new book by Clive Hamilton & Sarah Maddison called "Silencing Dissent - How the Australian government is controlling public opinion and stifling debate" gives cause to reflect on the strong sense of historically sustained deja-vu. Different times, different suspects? Jarrold was moving into the centre of the Australian government’s uneasy embrace with the saucer problem. In mid 1954 the Minister for Air William McMahon (a future Prime Minister) invited him to Melbourne for a meeting with RAAF on flying saucers. Andrew Tomas had made a request under the "Aliens Act 1947" for a name change from his Russian one in 1951 which was originally denied, but by 1954 he was using the name Andrew Tomas. It is ironic or something else to have this "Application by an alien for written consent to change surname", when one considers the following comment by Andrew at the end of an article he wrote for the last issue of Jarrold's Australian Flying Magazine, "Are you ready for a planetary Crash? ", pg. 7 February 1955: "In the circles of the duly initiated Brethern of Space, fantastic stories are told of saucers, messages from space and cosmic decrees. Perhaps I could tell you a science fiction story from my life how a saucer zoomed over the National Park in Sydney to say "Hello" to an incarnated spaceman. But who would believe it? In these days of suspicion and witchhunts it is better to keep one's mouth shut. Frankly, I am not too enthusiastic about a psychiatric test either. Anyway, my cosmic friends tell me not to worry about what other people say, but just place this information before the public. "It won't be long now," they say. Jokes aside, let us think more of the stars. Let us all become the children of Heaven. Let us dream of an Utopia where there is no hatred and no wars. But before we see that Utopia a red sign will flash in the skies, "Tighten your belts." As Ripley says, "believe it or not," but we are heading for a planetary crash." Now was Andrew Tomas being tongue-in-cheek here, or trying to say something else. He did have a UFO sighting at the National Park on March 24 1954. An uninformed outsider might have read "a red sign" reference in an entirely different light. Andrew Tomas continued his pacifist agenda theme. His widow Heather sent me Andrew's "Signs, Stars and Seers - An Experiment in Historical Prediction", a 48 page booklet published in Sydney in 1956. Therein he refers to warning Hitler, Mussolini & Hirohito through their embassies in China in 1935 (presumably via a copy of his “Planetary Doctrine” book) and being met "with hostility and ridicule, yet 10 years later the militarists had to sign humiliating treaties." Further he refers in the 1956 booklet forward to approaching "a responsible Soviet diplomat" 4 months after the defeat of Japan "with a project to establish friendly cultural relations with the USA and the British Commonwealth, long before the 'Cold War'. Though the offer was not accepted, the writer's mission on behalf of World Peace was fulfilled." The booklet includes the following "IF the national governments ignore this LAST WARNING, motivated by a desire to save this planet from destruction and mankind from self-annihilation, they will have to bear all responsibility for opposing the Cosmic Law of Unity." This theme was again revisited in March 1958, when Andrew, as secretary and organiser of the International Organising Committee of the Planetary Pact, sent a draft of the Pact to "top news agencies of the world." He would revisit this theme in his book "Shambhala: Oasis of Light" (1977). These and other matters could well have been misunderstood by the likes of ASIO? If the surveillance of the Queensland group QFSRB was any guide (see the primary profile document dated August 1959), then if UFOIC came under similar attention its committee would have been similarly profiled and rated NT ("No threat"? ), "U/I" (Under investigation"?) or simply commented upon. Any such documentation or surveillance would have been as seemingly pointless as the monitoring of the QFSRB group and the hundreds of other diverse groups activities around Australia. Ufologists defiled? They were like so many other people with diverse interests simply traveling through the distorted lens of a “sub rosa” perspective, defiled by the misplaced paranoia of the times.